It was 1959, He was 3 years old and would not be 4 until November 21st. The summer was hot ...He was the middle child of 5. His mother had given the oldest girl to her older sister to adopt. Not an unusual happening for that generation when a pregnancy happens when it shouldn't and you wanted no one to know. So as far as the kids and neighbors knew, he was the second to oldest. His older brother was 2 years older, his younger sister 2 years younger, and the baby was a year younger than the sister. Just a baby. Near by, the Grandmother lived and helped in the raising of the 4 kids, and the older sister and her husband also lived, on the same street, raising their adopted daughter, who was the birth daughter of the boys mother. The father, was in the picture as well. He became sick and was taken to the doctor. His mother heard the words that no mother ever wants to hear ...and at that time, a word that struck fear into the hearts of even the bravest of souls. A word that today, just means a simple 'well baby' trip to the doctor. But back then, it could mean the world would end ... it certainly meant the world as the family knew it was ending. They lived in a small town in Northern California, not too far from Sacramento. The city was too small to handle such a sick baby, and quickly, they transfered the three year old to San Fransisco's Children's hospital. 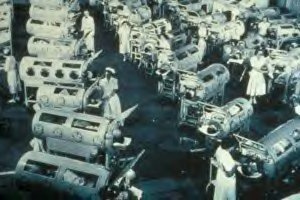 Just 9 years earlier, it had been a center for the polio epidemic, but polio was on the decrease, thanks to the vaccine. This child, had missed the vaccine. It was being given to school age children in his community, and he was not quite 4. His father, unable to handle the pressure of 4 kids and one of them terribly ill, just disappeared from their lives, abandoning them all. His mother took him to San Fransisco, where he was placed on an iron lung. 3 years old, and in an iron lung, in a hospital far from home ... with strangers ... and away from everything familiar. His mother, having 3 other children at home, decided to leave him in the care of the strangers at the hospital. I've tried and tried for 20 years to see this through her eyes, and no matter how hard I try, I simply cannot. I've had sick children ... I've had very sick children. I've sat in the hospital with a child that was sick with pneumonia. I've sat in the hospital with a child with meningitis ... and while I don't know what it is like to have a child with polio, I do know what it is to have a sick child. Over the next 6 years, the child would spend half of his childhood going through surgeries, and therapy ... in and out of San Fransisco Children's ... spending birthdays and holidays with nurses to celebrate for him. His playmates were the other children in the ward, and his teachers were the nurses. The six year old who had back surgery, to fuse his back 2/3 of the way ...or the 10 year old who had nurses to throw his birthday party. I see his eyes light up when I walk into the room and his face drop when I tell him I'm going to leave. If I had it physically within my body, I'd be with him 24/7. He may be a 51 year old man, but his soul is a 3 year old who's been abandoned once again ... and he's been there for a month today ..and he knows he has a few weeks ahead of him. Hi. Great you're writing and those words touched me dearly. You're a caring person and you love your hubby dearly. Praise indeed. Rightly or wrongly, the woman you mentioned might have freaked out when her husband walked out of her life and his children's. Subconsciously she might have given up on living if not for the children needing her. She is a responsible person but just couldn't cope...she didn't have the love and compassion of the community to give her support perhaps. Unfortunately many well-meaning Christians are a pain. As I grow older, I understand more fully why God sent His son to earth -- we believe in God incarnate when Jesus came in flesh. This love is the greatest...and yours my dear sister matches that God desire of His people. Keep you head high and keep writing...take care. You are a beautiful soul, and I do not doubt for an instant that your every visit brings healing to him. I'm sorry that I haven't been able to come by lately. But just because I haven't shown up around here doesn't mean that I have forgotten about you. It's a special gift that was given to you, to make you so caring. So willing. You are much to special for this world ... thank you for being here none the less. At the age of 3, I too contracted polio. The day I was taken to the hospital is burned into my memory. 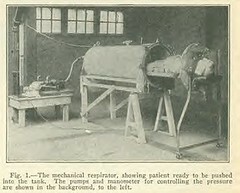 I remember being wheeled past the iron lungs. I remember being silent and terrified thinking wondering about those heads attached to those large machines. I remember my room with a glass window looking into the nursey on one side and another window on the opposite wall with a view of tree leafs. I remember well. While sitting with my dying father he shared with me what that day meant to him. When I told him that clearly remember that day he scouffed and said I was too young. When I described for him the details of the room he was silent for a long time before saying that he wouldn't have thought a small child would remember such detail. You are a very special person. You'll never really know why a mother would leave a child alone at a hospital. Understand that you had the advantage of her story and already constructed in your mind how you would want to behave. No doubt she was distraught and suseptible to a doctor telling her the best thing for her child is for her to go home. It really doesn't matter. What does matter is the mother's behavior over a lifetime. Was she loving otherwise? Life With, I'm sorry you went through that as well. I think, if my Mother in law had been otherwise loving ... my heart would go out to her as well. but time and time again, I saw her make the choice that is easier for her ... Including marrying a man who was known to be abusive when my husband was 12. Then not protecting her children. So no, her pattern in parenting was to abandon her children at every juncture that she should have chosen to protect them. The pattern continues to this day. Your husband is a blessed man to have met you and to have won your heart. As for his mother. She appartently has worked hard to be a lonely woman in her twilight years. I wish her luck in her emotional solitude. She has earned it. This is a deeply moving, poignant, well-written post. My heart just aches for that sick, lonely little boy and for the scared, little boy inside him now. I know you have to stay healthy yourself and take care of yourself...but he is so blessed to have you. It's so obvious how much you care for him and love him. That is a special gift!